Rent villas in Agia Triada, Crete with private pools. Book affordable holiday rentals that are near a beach. Luxury 4 bedroom villa with breathtaking views of sea and countryside , private pool, air-con and welcome pack included, Private gated off road parking. Villa Francesca, a lovely private luxury villa set in mature gardens with private pool, enclosed with high walls, bordering olive groves and stunning views of the mountains and the sea. 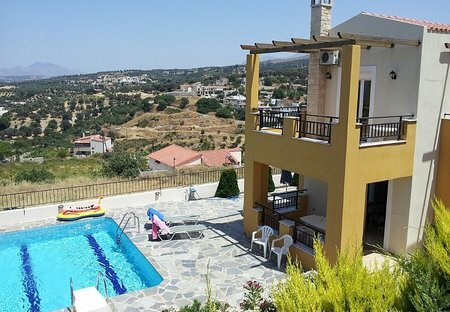 Villa Alexandra, 4 bed villa, with 2 self contained apartments and private pool, Great for extended families or groups of friends holidaying together. 4 bed villa. Villa Sunset, Agia Triada is a traditional Cretan villa with a private pool, hammock on roof terrace and stunning views across the valley to the sea.